In a move that alarmed many citizens, the state owned National Power Corporation decreased the water supply to Metro Manila and Central Luzon to avoid a water crisis this summer. 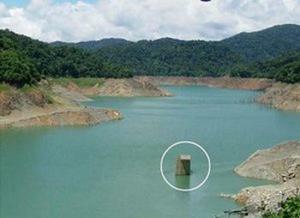 Residents and officials are particularly concerned after last year’s crippling water shortage in which the Angat dam dipped to a low of 157.66 meters in July 2010. According to the Manila Bulletin , officials are closely monitoring the Angat dam which provides 97 percent of Metro Manila’s water. Earlier this month, the Angat dam was measured at 204 meters sparking concern as it should be at 210 meters at this time of year to ensure there will be enough water until the rainy season begins. Last summer’s water crisis affected nearly 50 percent of residents in Metro Manila, with supplies reduced to some portions of the city by as much as 600 million liters a day. 2.9 million residents received less than six hours of water a day, while thirty two villages had no water at all. Public Works Secretary Rogelio Singson blamed the National Power Corporation for causing the shortage after poorly managing the water supply. The National Power Corporation is accused of “excessively releasing” water from the Angat dam after heavy rains, caused by a tropical storm, swelled the dam. The National Power Corporation is a state owned company that is the largest provider of electricity in the Philippines. Officials resorted to cloud seeding operations over Angat dam in an attempt to trigger rains that would raise water levels. While operations were successful in raising water levels more than ten meters, efforts were still not enough to entirely avert the crisis. In an effort to prevent future shortages, Philippine Senator Edgardo Angaro called for the formation of a public-private partnership. Senator Angaro believes that a public-private partnership can improve water and sanitation infrastructure and that it is badly needed. “PPPs have the potential to play a key factor here. Since the government can only move so fast, a swift and sure solution would be for [local government units] to reach out to private funding institutions like the World Bank to develop the necessary infrastructure in water and sanitation and lessen our yearly losses,” he said. “Our nation already faces many challenges in the face of climate change. By understanding that we need to reduce these risks by planning properly, we can help our country become resilient even in the face of impending crises,” Angara said.